Never met Wes Humpston. I wasn’t there when Lucia took his portrait, and our only communication was by email. Reading up on Humpston online and in the Concrete Wave book Bulldog’s Art by Wes Humpston, I began to understand that Humpston was a part of the Dogtown skateboard crew beginning in the early 1970s. He wasn’t an official Z-Boy, but he was skating banks and pools with all of them and was friends with Alva, Adams, Muir and that crew. When the Zephyr team began to break up in 1976, Humpston teamed up with Jim Muir to start making Dogtown Skates. 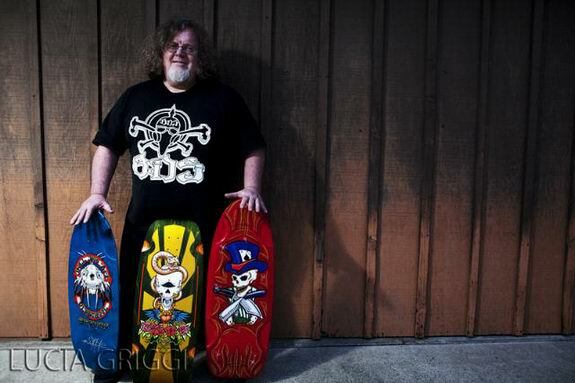 Humpston had done hand-drawn art for the Z-Boys and other members of the Santa Monica/Venice skateboard crew through the 1970s. But when Humpston began recreating his art on the Dogtown decks, he became one of the pioneers – if not the pioneer – and a foundation influence for all the thousands of deck graphics to come in the 1980s, 1990s and 21st Century. And it’s also possible Wes’ big feet were inspirational in skateboards evolving from 7” and 8” to as wide as 12” toward the end of the 1970s. Humpston lives in north San Diego County. He is very creative in his use of punctuation and capital letters in his emails. Some of that creativity is left below. Dogtown is credited with being the first to get really creative with graphics on decks. Do you believe that is true? Well I don’t remember anyone drawing on skateboards or companies doing art on them for each model – different art for each rider. I know Craig painted some for the shots in his Skate Mag articles. I’m not sure when but I never saw anyone drawing on them like I did. What came before you as far as deck graphics? From what I remember they were flat, one-color logos – simple graphics with type. There were some fiberglass boards with the photo/patterns type of thing laminated onto them. If you had to list the most important heads on the “Mount Rushmore” of skateboarding – the riders, designers, marketers who changed the sport the most – who would those heads belong to? For me first would be Craig Stecyk who was a big inspiration to me and so many others for his art, writing and photography that made so many want to make at & go surf and skate. Second, Tony Alva for being the first world champ and inspiration for so many to skate. Third, Natas Kaupas for giving skateboarding a new direction when it had all pretty much died. Fourth is Tony Hawk for taking skateboarding to such high levels as a professional skateboarder, being good in business & being a role model for kids. You and Jim Muir started Dogtown Skates but if I have this correct, he was on the Zephyr team and you weren’t? Or is that wrong? When and where and how did you start skateboarding? Do you remember what your first skateboards were? Were you drawn to graphics then, so to speak? One of my first boards was a 26” or 27” I cut out of plywood then put on a shaping stand and tied a cinder block to the middle and fiberglassed it so it would have rocker, like the old Makaha rocker. I had a Z-Flex or two & I made some from cutting down Muir’s Sims longboards. For the art, in fifth grade I remember cool art in books and Indian head-dresses from way back then. We would draw them instead of school work. Hahahaha. An early Dogtown skate, made around 1975 in the backyard: 6.5” wide by 30” long. Board courtesy Wes Humpston. Who influenced, inspired, mentored you into skateboarding? Surfing. It was always about surfing on the street, then banks. 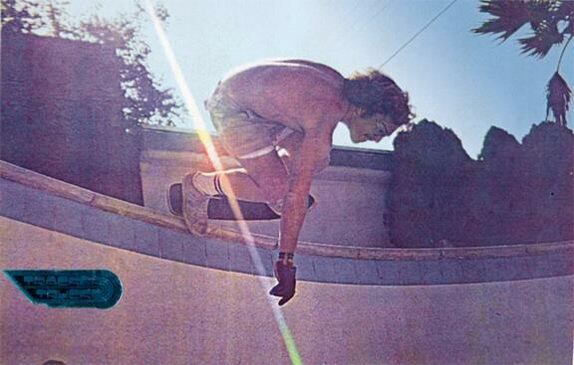 Tony Alva took me to my first pool and Jay Adams lived two houses over so pretty much all the DT guys. We would spend the weekends riding banks at the schools then pools started & it went underground ‘cuz you wanted to keep the pool. I hung with and skated with most the DT guys at one time or another. What schools did you got to and were any of the Z-Boys or DT guys in your grade? I’m two years & two grades ahead of all them. TA, Muir & Bob Biniak were next then Jay & Wenzel & Shogo are the same age. Baby Paul was the youngest… I went to John Adams for Junior High in the late 60s but I hung with two guys my age then: Kevin Keiser & Craig Hollingsworth. Not sure about the others ‘cuz there were three Junior Highs I think in SM & only one High School – Santa Monica High aka SAMO. I started High School in 1970. I saw TA and Muir in High school ‘cuz of Surfing Class but they were Scrubs 1st year & I was a senior in High School & they were two years behind me in 1974. I would see them at the beach the next year & then when skating started we would hit the some of the same places…. What was your progression in boards and skills? At what point did you become a competitor and/or a professional? I was never a competitor and really never thought I was good e-nuff but I did get money for my board designs & art & had a really good time with it all in the mid and later 70s! Where do your art skills come from? Family thing? Did you attend Art School at any point? What was the original inspiration for the Dogtown Skates logo? And can you define “Dog Town” for what it means to you? Is it a distinct area? Does it have street borders? Where did “Dog Town” come from as a name? 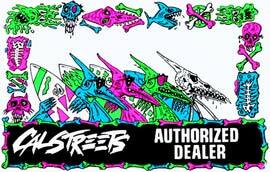 Was there ever any problem with Stecyk or Ho or any of the Z-Boys about using the Dogtown name? At what point did Jim Muir leave the Z Boys and when did you and Jim start Dogtown? Not sure the year or month but Jim, Paul Constantineau & Bob Biniak rode for Sims for a while after leaving Z-Team. Some of the bigger/longer boards Jim got we cut off the tail, glued it back on & grinded it into a wedge to make it a 30″ to 31″ board. That was what we liked in pools at that time. It seemed like we were always making skateboards when we weren’t surfing. Why did you start Dogtown Skateboards? Was it to make tons of money, or just to do a local project you wanted to do. It was all about making a better board to ride. The boards really sucked back then & were flat out dangerous to ride. There wasn’t money in it at the start but as the boards got better people wanted them & we were turning out a few to 10 or 15 on good weeks depending on how hard we wanted to work & if there was waves or not? We were selling or trading them for a nice profit so it worked out nice. Was it just you and Jim doing Dogtown? Who did what job? Where were your production facilities? They started in my folk’s back yard till one day we made a bunch & there was so much dust it looked like it snowed. When my dad got home from work he wasn’t having it, so I started making them at Kevin Kaisers. Kev & I had made bellyboards there for years cuz I also got kicked out of the garage for making a mess glassing bellyboards, kneeboards & fixing surfboards. Hahahaaa As for the art it was just where ever I could find a place to do the work, pretty much. Do you remember what your first product was? The deck? The DTS 10″ x 30″ Bulldog Design. Yeah baby! Hahahaaa When DTS started, Paul Constantineau already had his 8 1/4” x 30″ model & Jim wanted a 9” x 30″. What wheels and trucks did you use, and did that evolve? How did Dogtown do business wise? So I am wondering, how were things when Dogtown really got rolling? Do you know how many boards you were selling a month? Were you two getting rich? The boards seemed to be all over the parks & the mags. We had a pretty good-sized warehouse that had pallets of each model, boxes of shirt’s & wheels. It was like Christmas a few times – just grabbing boards & wheels, weather Mutt & Jeff knew it or Not! Hahahaaa. Then we’d stop by the skate park at Marina Del Rey & hook up some kids that had beat to crap boards. You guys started up at the end of the 1970s, when the Second Boom was busting. How long did the business last? Yeah two years max until mid- to maybe late-1979, then the wheels started coming off. It was pretty sad. I would hear stories from the guys at Skate City about stacks of our boards at Swap Meets for $5.00 & under a board…Ouch! The checks stopped and ‘ya couldn’t find Mutt & Jeff. They were long gone back to NY was the word. Has Dogtown been producing boards since the late 1970s or has the business come and gone and come again? 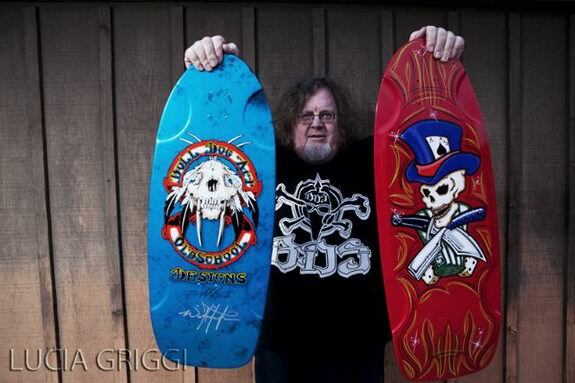 Jim has kept Dog Town Skates through the years. By ‘79/80 it was done so I got a good job in the printing trade (thanks to a girlfriend at the time that was tired of paying for sushi – hahahaa) & did art on the side for a few people. Jim started it back up early 80’s & I did art for him as side work through the mid 80’s & would sign it as “BDA/Bulldogs Art.” I still made boards at home but was always kind of bitter toward the skate biz. I moved from DT late 80’s & missed making boards so I started making them at home again mid-90’s. I started Bulldog Skates later 90’s on the side. This interview is going into a chapter about the 1970s, so we have to stay within 1981. Later in the book we can show some Bulldog Skates. But for the record, you were involved with the Zephyr team and the Z-Boys and Dogtown during the times that have been immortalized in books and documentaries and feature films. Is there anything about how Dogtown has been media sensationalized that bothers you? Time to get it off your chest. Yeah for sure. I dug “Z-Boys & DT” & loved the old photos & footage. The Z-Boys were cool but I felt that Dog Town was really the pool riding & only ½ the Z-Boys really rode pools. So I felt there were things left out that were way more rad than the “Little Hair Spinner from Charlie’s Angels” IMO… First is John Palfreyman – the first to ride a BMX bike in a pool & not just ride it: ripping it! 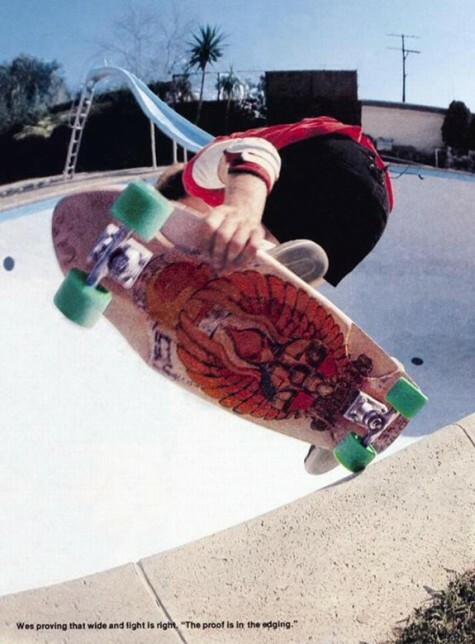 I would love to have seen more Craig & the older guys that were really the framework for Dog Town/Santa Monica with their art and surfing, and also the other skaters that ripped pools & was all left out…..